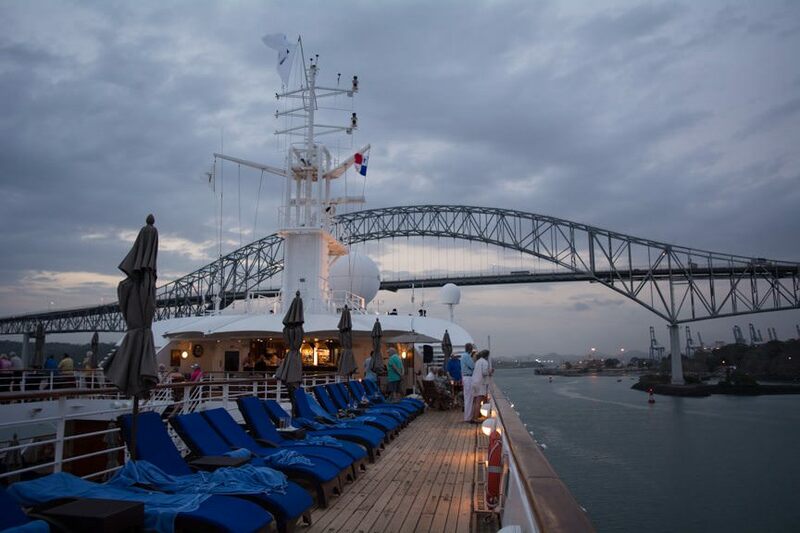 My last day aboard Windstar Cruises’ Star Breeze was all about Panama City and the nearby Panama Canal. 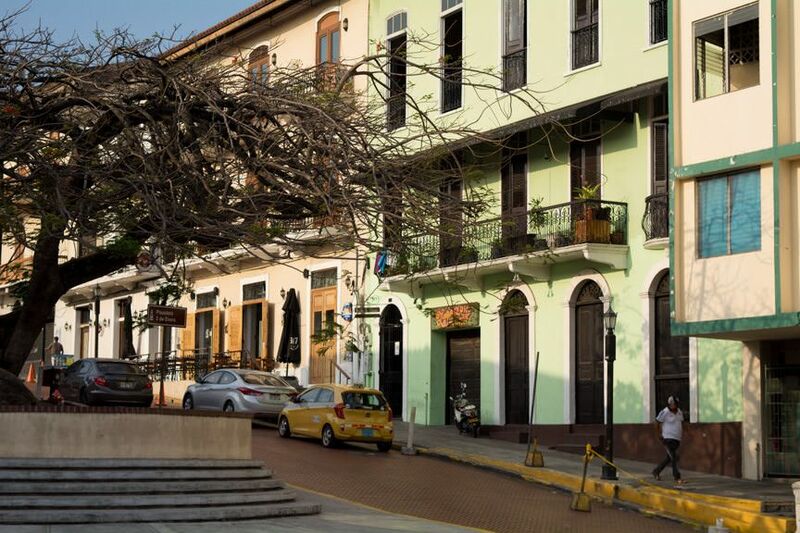 With our transit from the Pacific Ocean to the Caribbean Sea expected to take place sometime this evening, I decided to maximise my Canal time by booking the $89-per-person tour that Windstar offers of the Miraflores Locks & Historic Panama City. Disembarking via Star Breeze’s zodiac and tender boats at the bleary hour of 7:00 a.m., our four-hour excursion first ran into a little snag: it was so early in the morning that no one at the small marina had thought to unlock the dock gate. 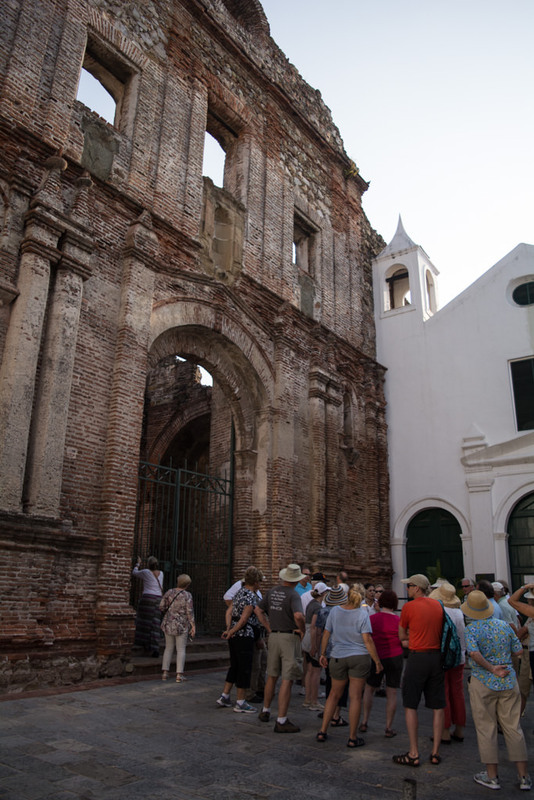 When the chap with the key was finally located, we made our way onto a waiting motorcoach and set out into historic Panama City, known as Casco Veijo. Casca Veijo was first founded in the late 1600’s, after the original city was brutally sacked by Welsh privateer Henry Morgan, loosely of Captain Morgan’s Rum-fame. A legendary drunkard and sadist, he accidentally burned down old Panama City after another binge of looting and pillaging in the name of England. However, Morgan bit off more than he could chew this time: he was recalled to England to answer for his crimes. For these, he received a knighthood and a plum post down in Jamaica. Such was the life of a 17th century privateer. 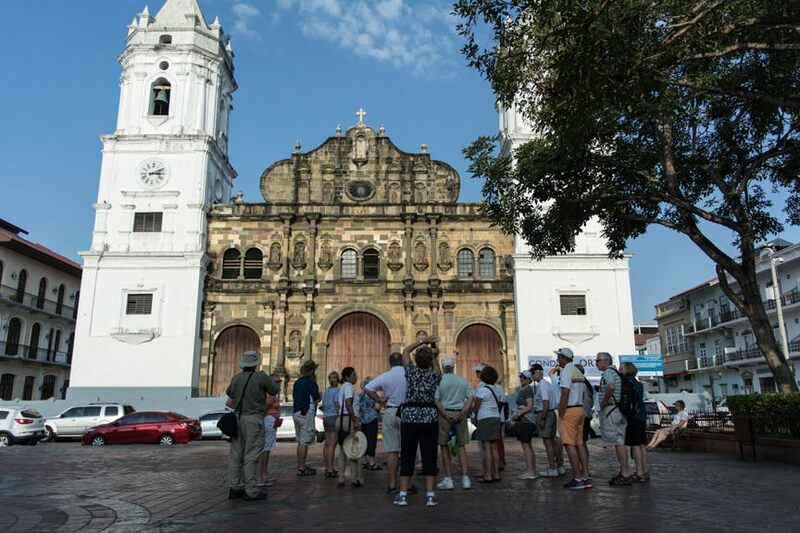 In Casca Veijo, we set out on an hour-long walking tour through this most historic district of Panama, which resembles a familiar cross between Havana, Cuba and San Juan, Puerto Rico. 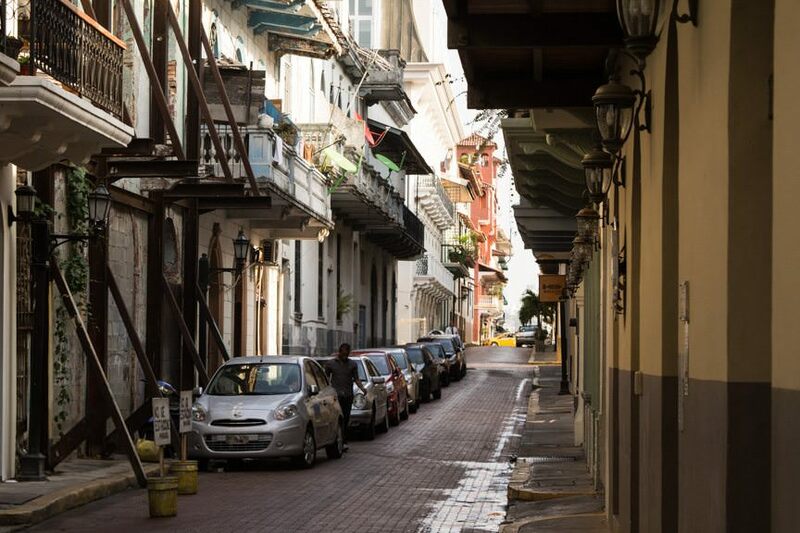 It’s narrow, winding streets are fascinating, and I’d reckon it’s a must-see on any visit to Panama City. 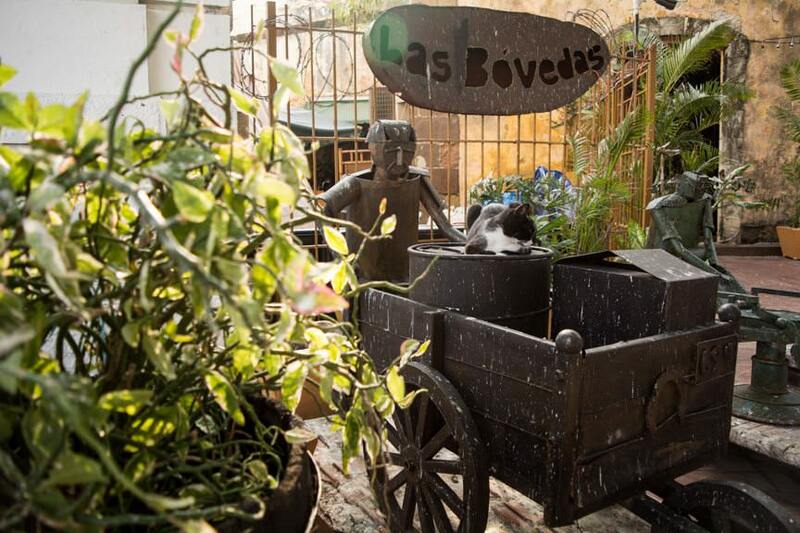 Unsurprisingly, Casca Veijo includes some of the city’s oldest landmarks, from the National Theatre to the decidedly Spanish-influenced Catedral Metropolitana (Metropolitan Cathedral), which took a century to build between 1688 and 1796. 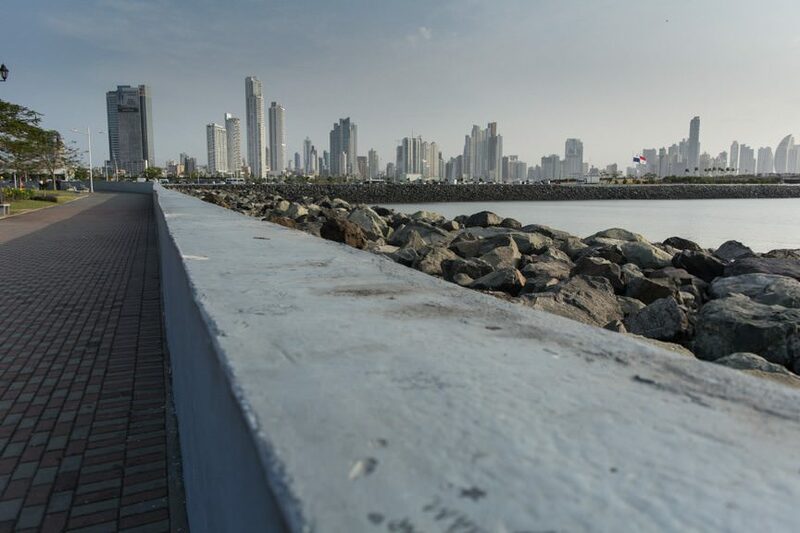 It is here that the Declaration of Independence was signed on November 3, 1903, officially separating Panama from Colombia. It’s also hot. Very hot. In fact, I was surprised to look down at my watch halfway through our walking tour to discover it was only quarter to nine in the morning. The mercury had risen to such an extent that most of us were perspiring through our shirts by that point. That’s when you realize just how close you are to the equator – a mere 622 miles, or 1001 kilometres. 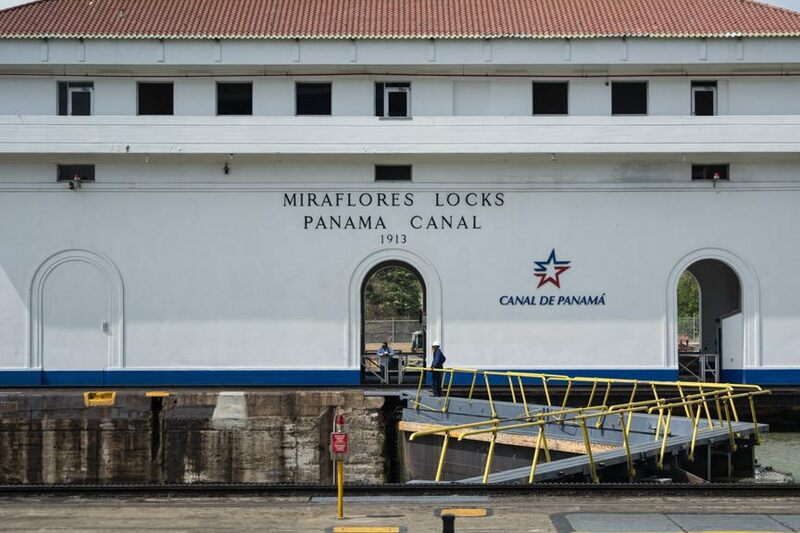 Of course, no trip to Panama is complete without a visit to the Panama Canal – and that took us to the Miraflores Locks, just 30 minutes outside of the city. 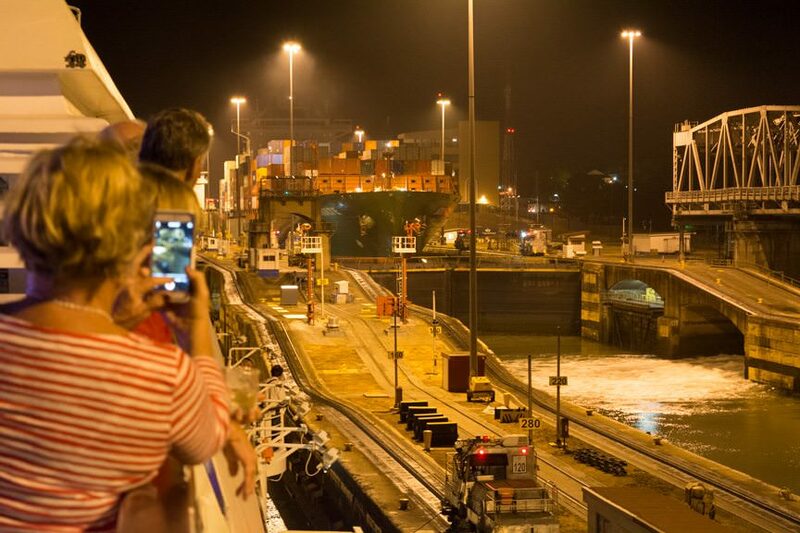 It is impossible to talk about the Panama Canal without discussing its turbulent history. For such a simple project (‘let’s build a canal!’), the Panama Canal turned out to be a Pandora’s Box of trials, tribulations, and death. The first man to attempt this feat of engineering was Ferdinand de Lesseps, a French diplomat who was the mastermind financier of the Suez Canal. 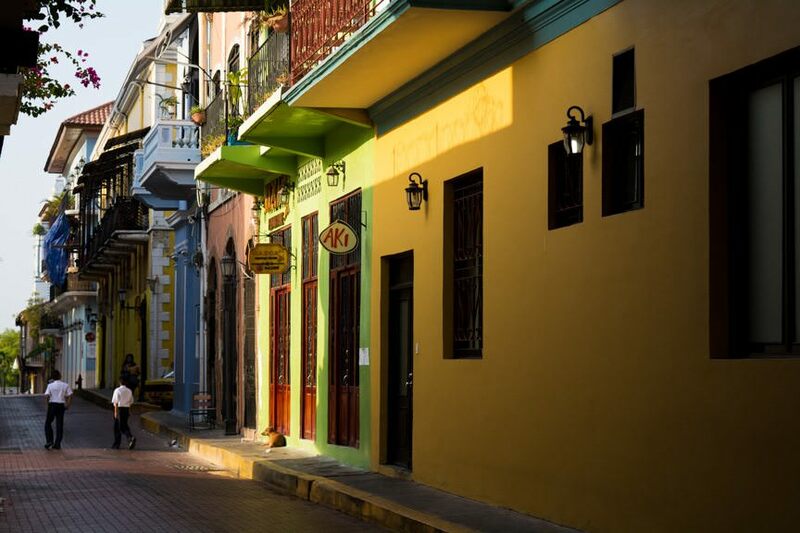 De Lesseps was a visionary, but he vastly underestimated the terrain of Central America. Having only scouted the area during the dry season, de Lesseps unwittingly plunged his men into the ferocious rainy season of 1881. At one point during construction, the death toll was 200 people per month. 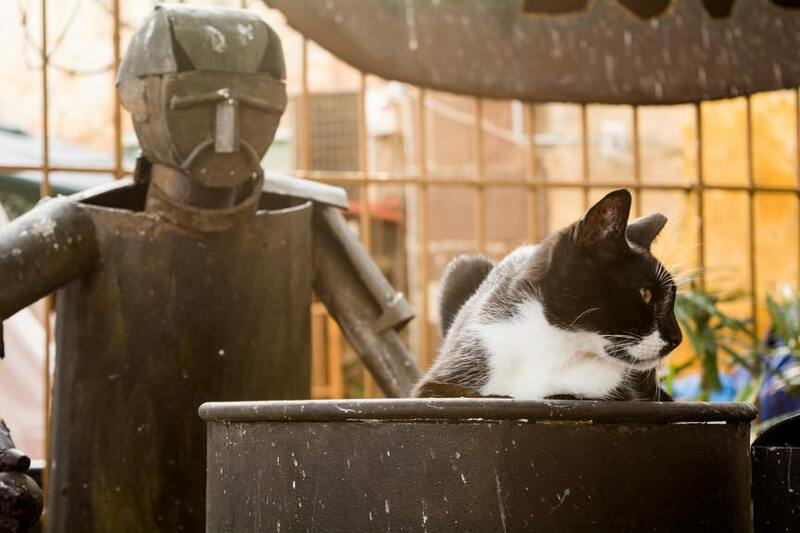 These deaths were attributed to a potpourri of factors, from floods to snakes to malaria. Eight years later, Ferdinand de Lesseps was arrested for misappropriation of funds. The French cancelled the massively over budget program, which had lost 22,000 lives and over $287-million dollars. His plan to dredge the canal at sea level was a failure. 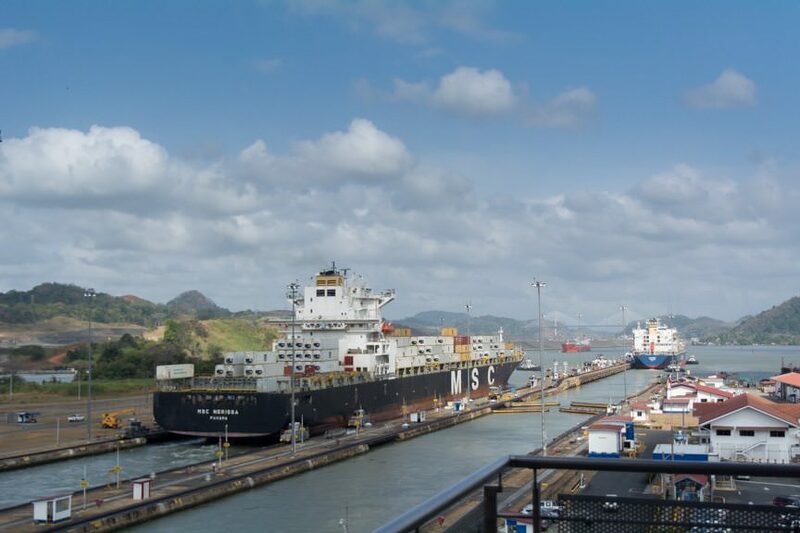 The Panama Canal would ultimately be constructed by the United States of America, which would also administer the Canal until January 31, 1999. Rather than attempting to dredge a sea-level canal, as De Lesseps had, engineers planned to employ a lock system to raise and lower ships from the Pacific Ocean to the Caribbean Sea. 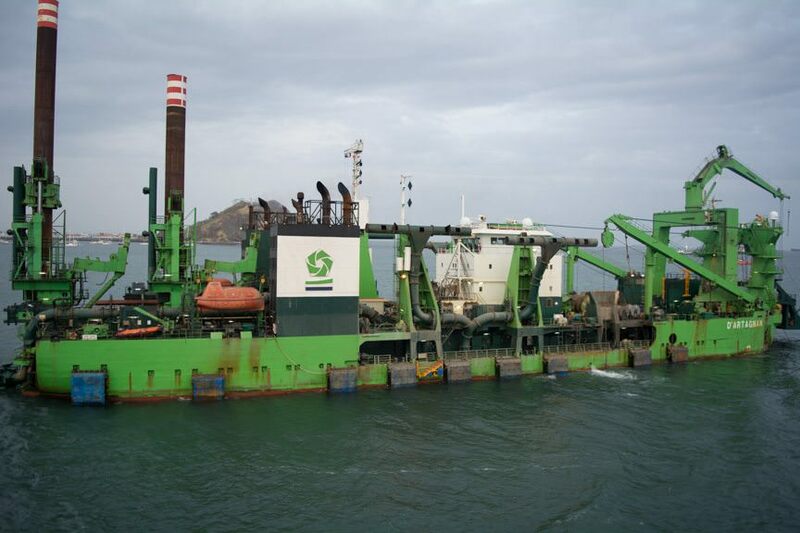 They would also need to create the world’s largest man-made lake – Gatun Lake – in order to complete the project. Although the wet season and mosquito-borne diseases like Malaria were better understood thanks to the efforts of doctors like Walter Reed, the Canal would still result in the deaths of nearly 6,000 people during the decade-long construction project. The Canal opened on August 15, 1914 – just weeks after the start of World War I in Europe. 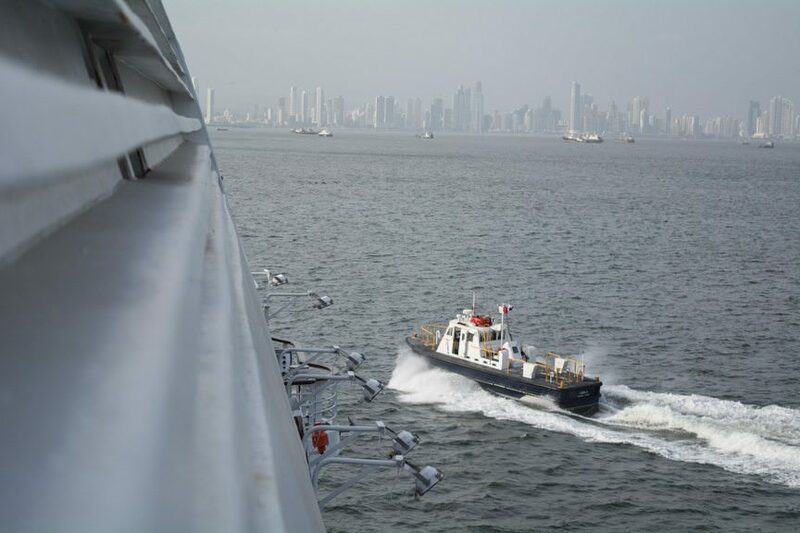 The S.S. Ancon was the first of 1,000 vessels to transit the Canal that year. 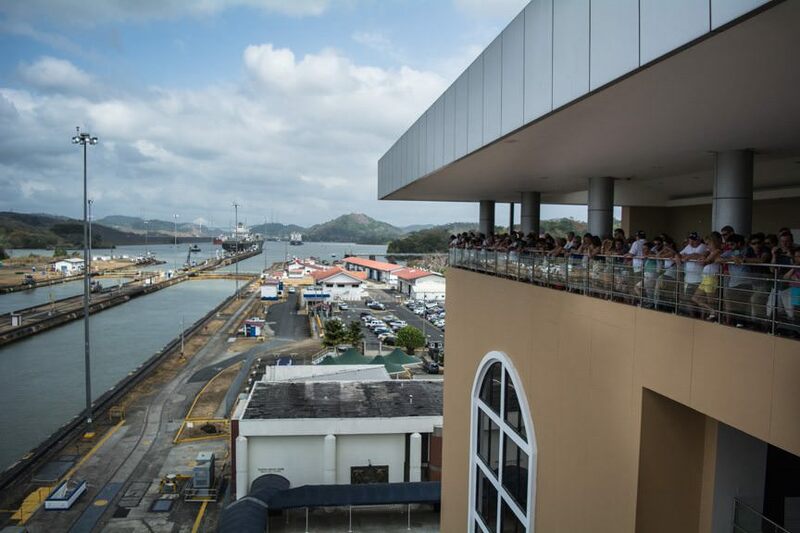 From the Visitor’s Center, we had a good – if crowded – view of the Miraflores Locks, the longest and deepest locks of the Canal. 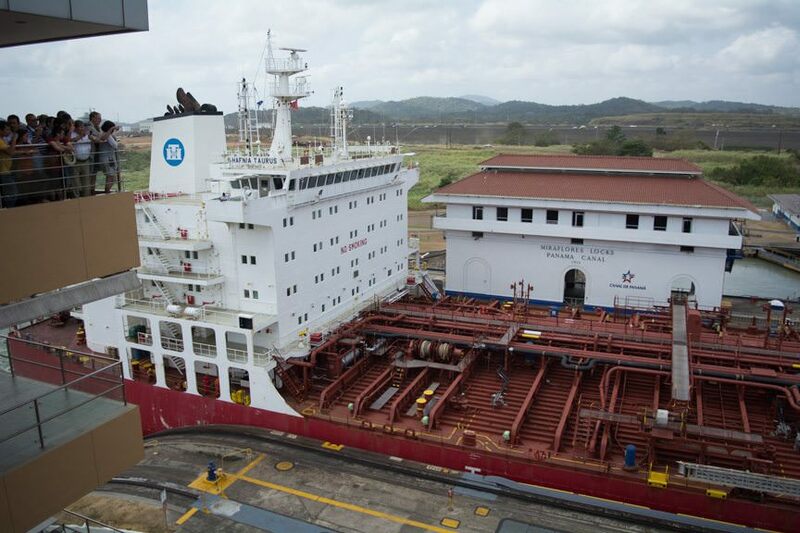 The new locks, located near to the current ones, are expected to be operational by this summer and can accommodate so-called “Post Panamax” ships. The entire operation is one of the most amazing things I’ve ever seen. 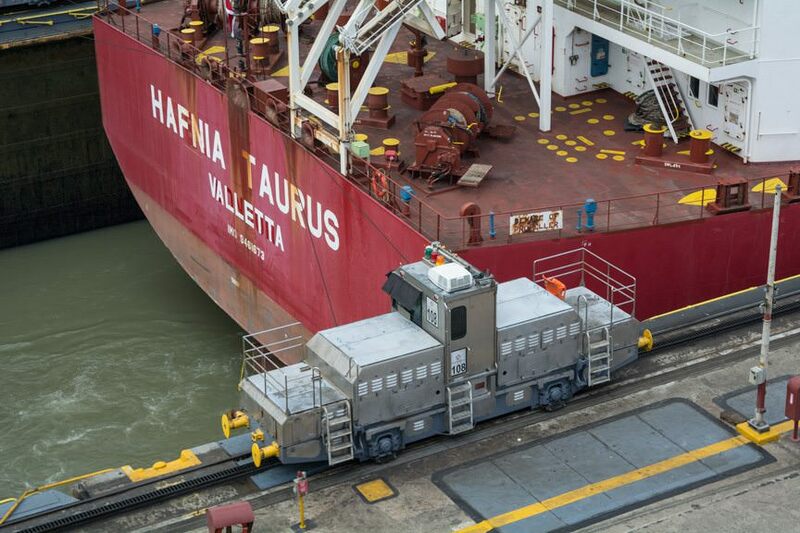 It operates only on water and electric power, right down to the electric locomotives, or “mules”, used to pull ships along by giant metal lines attached to their mooring bollards. Although it’s extraordinarily crowded on the viewing decks of the Visitor’s Center, which opened in 2003, this excursion provided an amazing overview of the locks and the way they work. 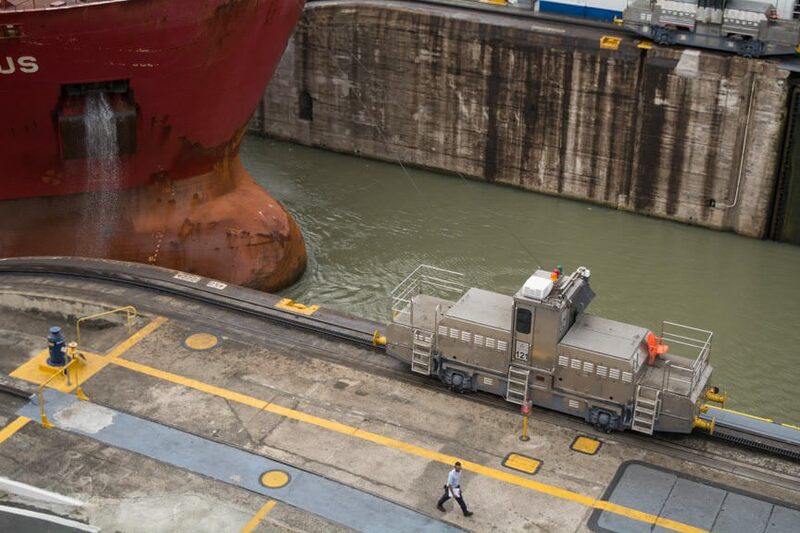 We watched as one massive cargo ship transited the locks in their entirety; a technological ballet that is performed dozens of times per day, around the clock. It would also be a great primer for our own transit aboard the Star Breeze later in the day. 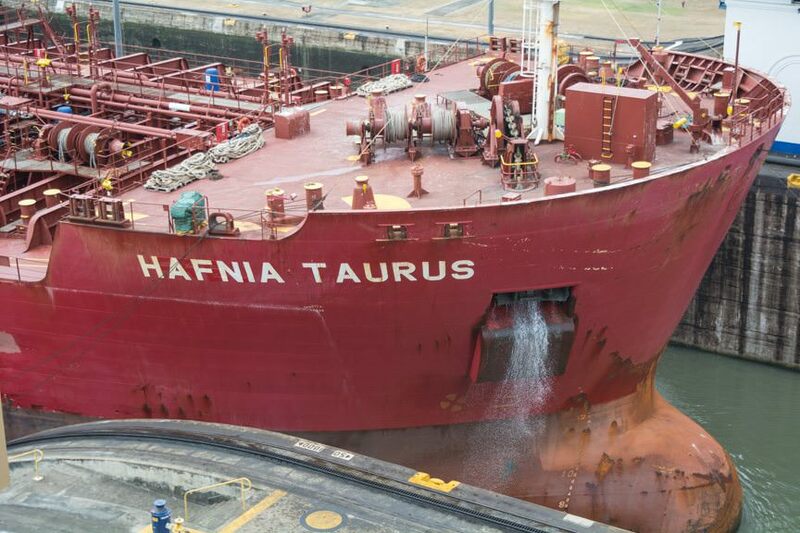 At 1:00 p.m., Star Breeze raised her anchor and sailed a short 1.6 nautical miles over to her temporary anchorage in the queue of ships waiting to enter the Pacific side of the Panama Canal. 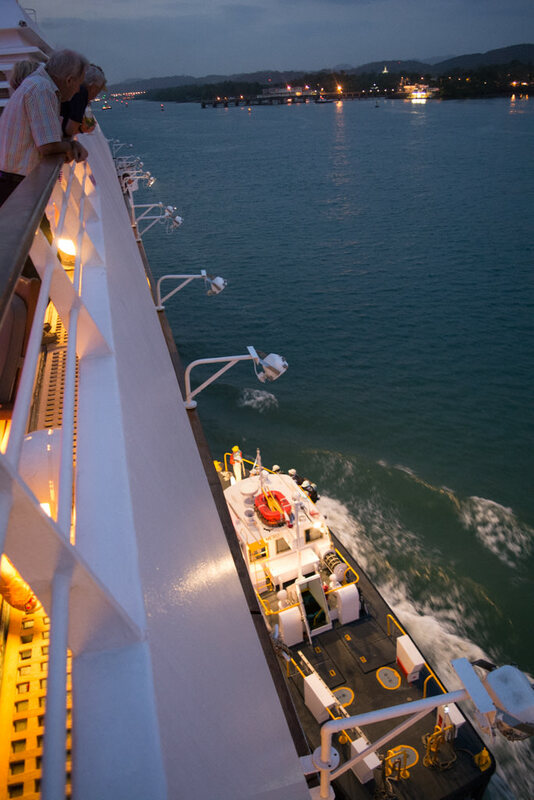 From there, we’d have to wait until 5:00 p.m. for our Panama Canal pilot to come onboard, and another hour to get underway. Finally, just before 6:00 p.m., the Star Breeze rumbled to life. Radars turned and grey smoke began to emerge from her twin funnels. 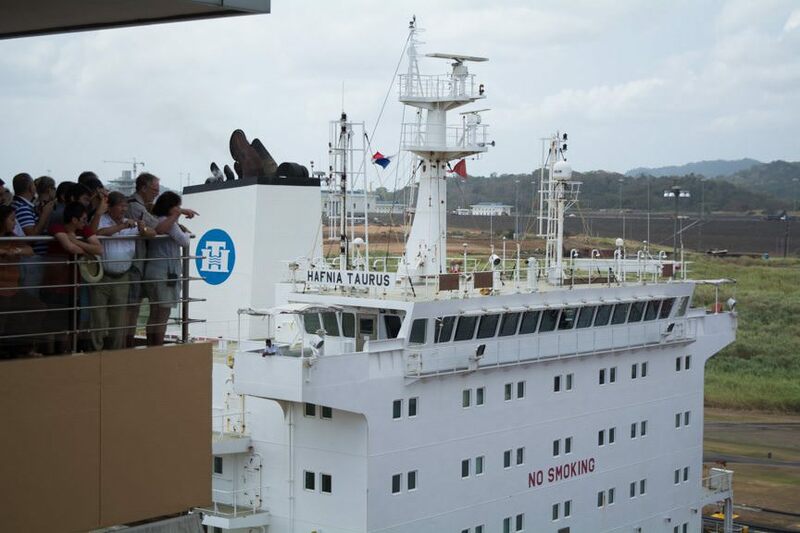 Vangelis’s Conquest of Paradise came over the public address system one last time, and guests cheered as the Windstar house flag was raised for our transit. 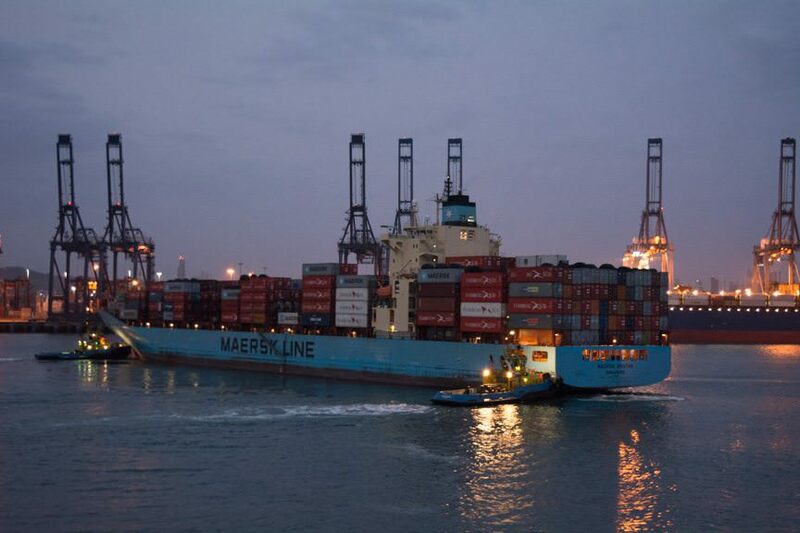 Now, if you’re expecting this to be a daytime transit of the Canal, you’re going to be disappointed: Star Breeze does her transit at night, lasting from around 5:00 p.m. (scheduled) to midnight (scheduled). 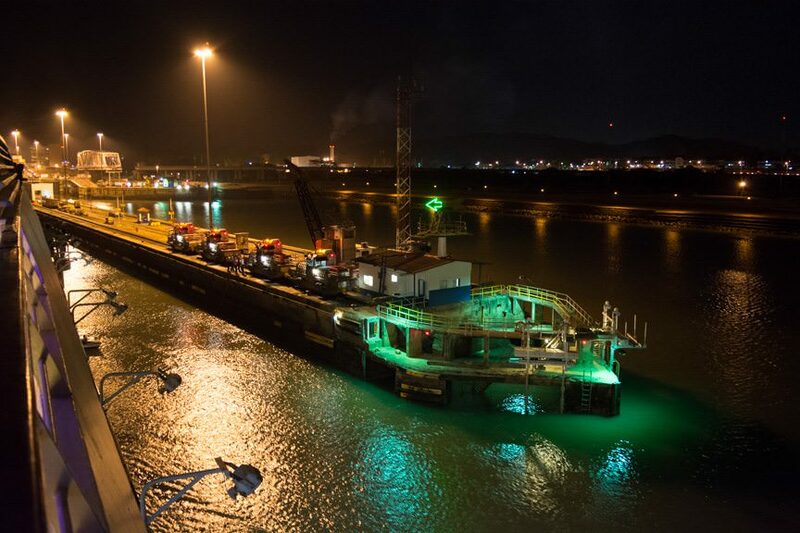 Ours ended up being 6:00 p.m., with the entrance to the Miraflores Locks around 7:10 p.m.; the transit lasted until just before 2:00 a.m. Early brochures list the transit time as 2:00 p.m.; later itineraries (and the website) have been redone to reflect a transit time of 5:00 p.m.
More reasons I enjoyed this nighttime transit: it’s quite unique. Most cruise ships do a daytime transit, during the sweltering heat of the day. 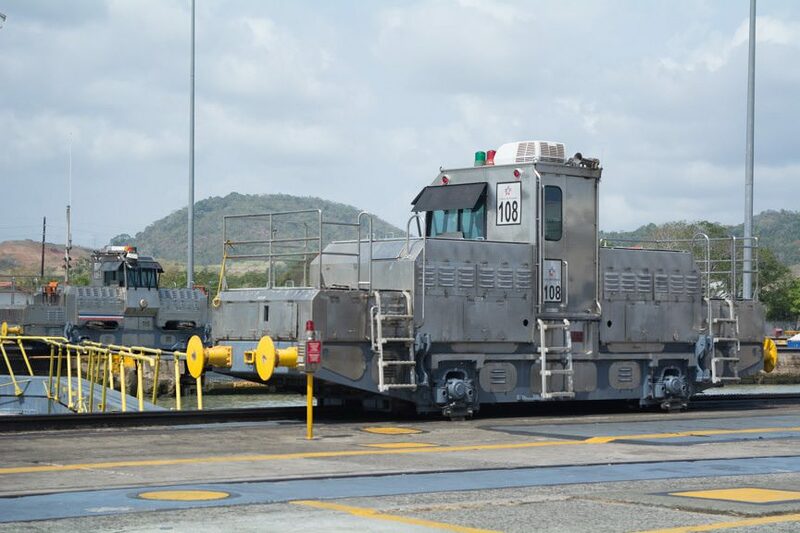 And while it’s true I slept through our passage to the Caribbean Sea via the three Gatun Locks, had I been on a daytime transit I probably would have done something else at some point. After all, once you’ve “climbed” the Miraflores and Pedro Miguel Locks, you start to get a feel for how this is all going to go. 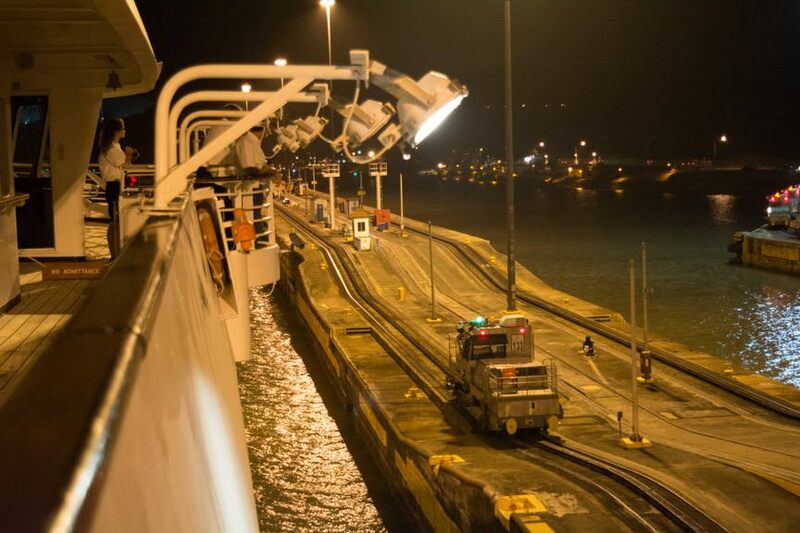 In the end, transiting the Panama Canal at night seemed to be the ideal bookend to a satisfying cruise, done in Windstar’s own, unique fashion. It’s often imitated by other lines – but, as I discovered this week, never replicated. 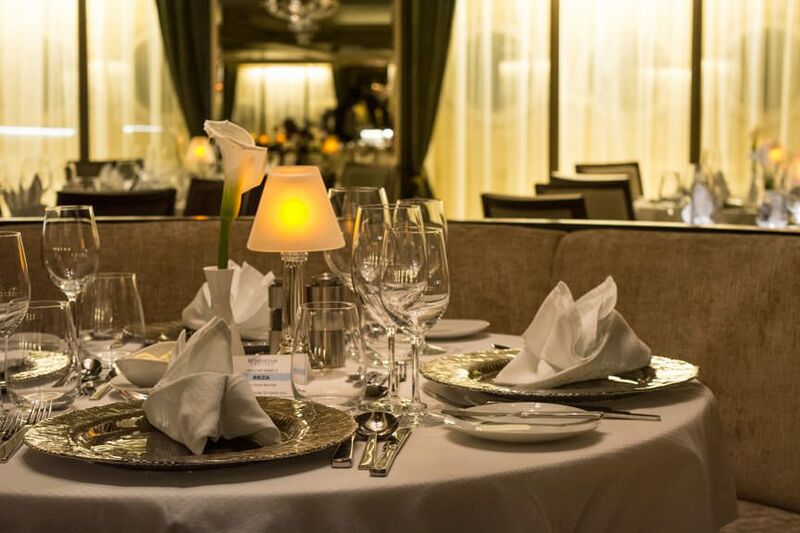 Our Live Voyage Report from onboard Windstar Cruises’ Star Breeze has sadly come to a close, but stay tuned for an update of our Star Breeze Ship Profile and a full Voyage Recap to come. Be sure to follow along with our adventures on Twitter @deckchairblog. 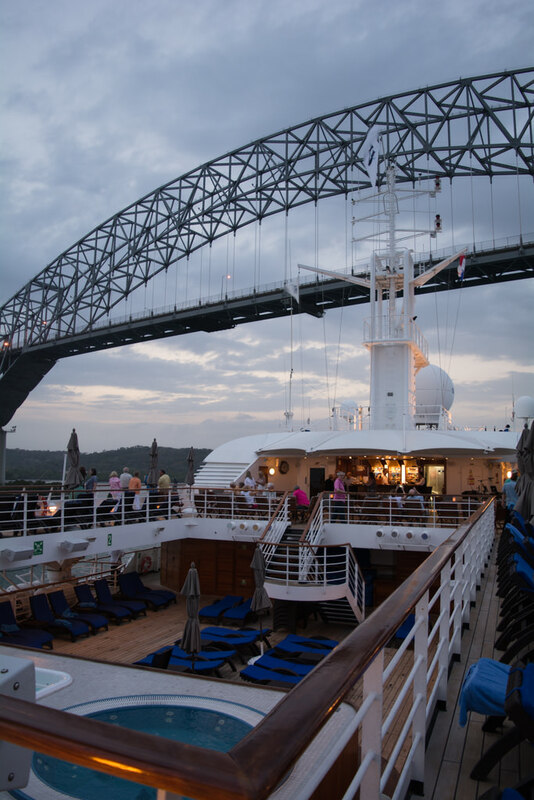 Two questions: 1) Windstar seems to tender at most every port (other than embarkation & debarkation): even ports that have docking facilities that could easily accommodate a ship of this size. 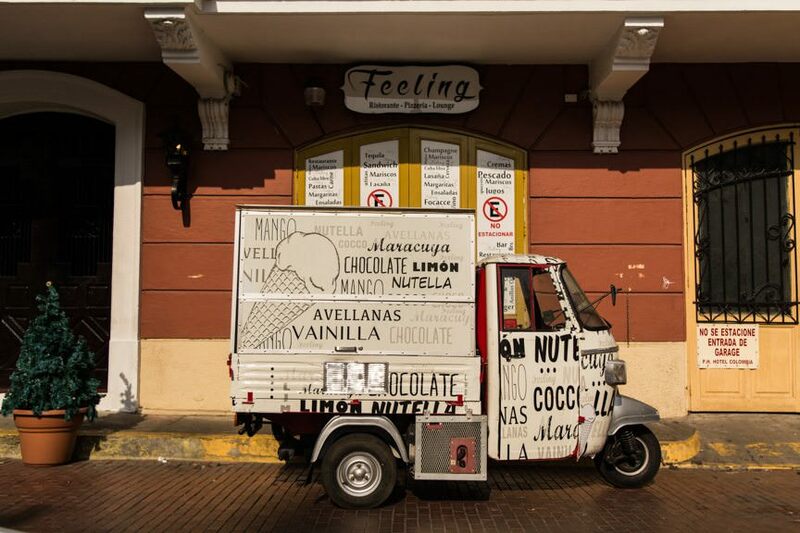 This pattern seems to be pervasive and includes many of their European itineraries as well. It’s been suggested in some reviews that this an effort to save money on port fees, though guests much prefer a ship to be docked. What’s your take on this? 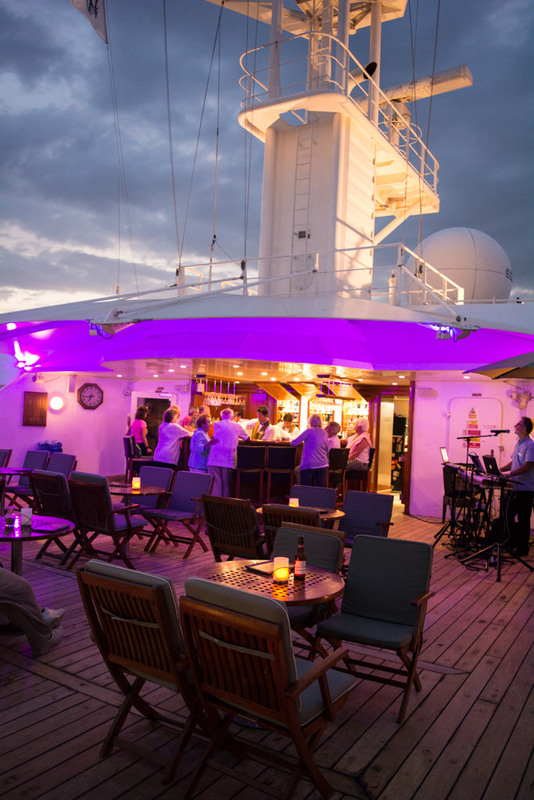 2) What ship management company does Windstar use to hire the ship’s officers? 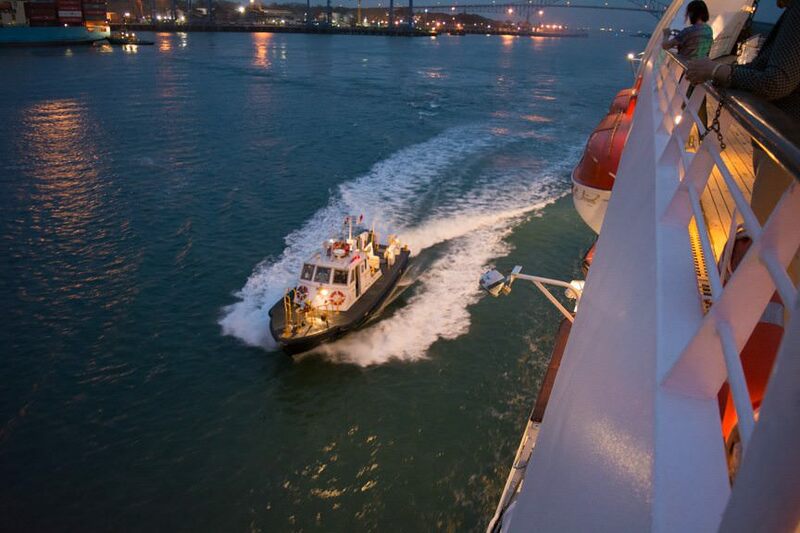 I generally prefer a cruise line that prefers to have total control and has the infrastructure to hire its own officers and crew. On this particular itinerary, we were at remote locations that didn’t have docking facilities for the vast majority of the voyage. We did dock in Puerto Caldera and Colon, as I’d expect. 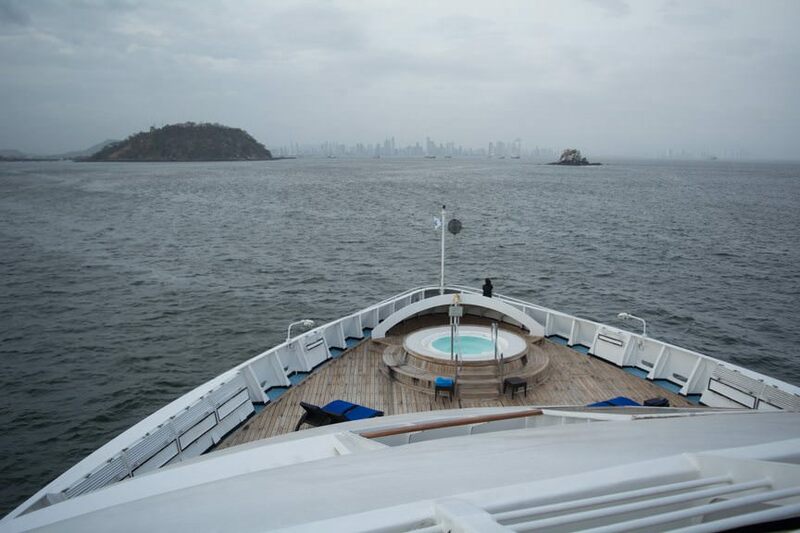 On some cruises (notably the Galapagos), even embarkation and disembarkation takes place at anchor. 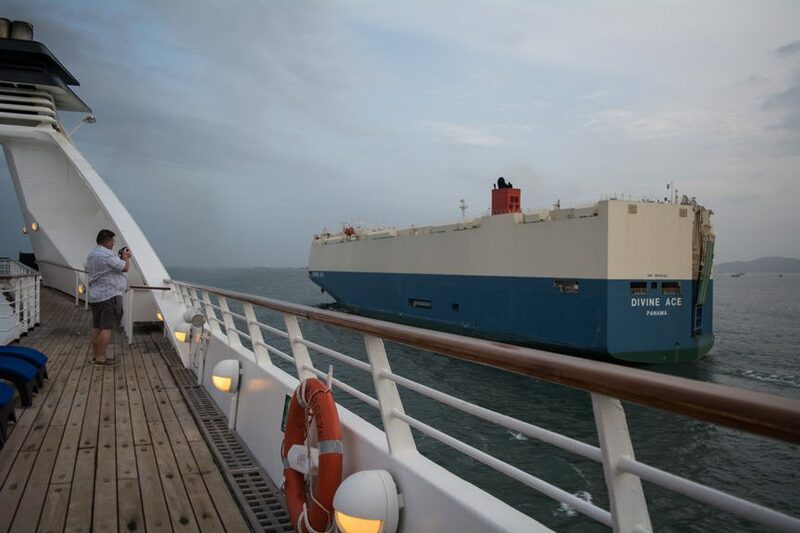 As to the line’s use of tendering when in Europe, I personally haven’t experienced that; my previous European voyages with the line have used a mixture of docking locations and tender locations, depending on the port of call. 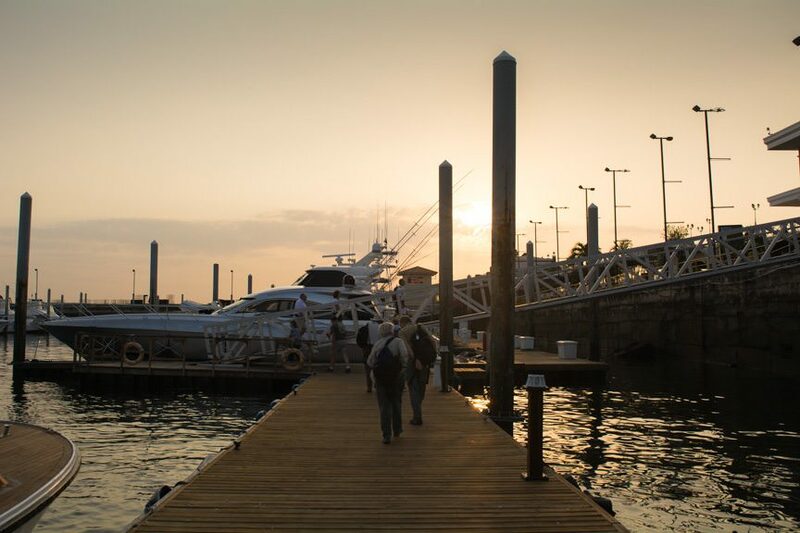 Certainly, as far as Panama & Costa Rica are concerned, this is more of an expedition itinerary; docking locations just aren’t available at the places we called on. 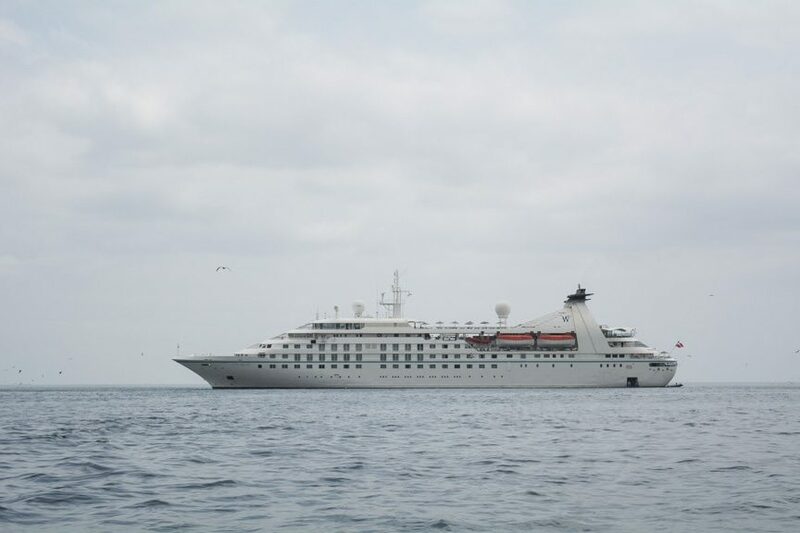 As to the ship management company, Windstar utilises Viking Recruitment for deck ,engine and hotel departments. Spa, casino and entertainment are hired through separate companies.